Holland Park is a public park in the area also known as Holland Park within the Royal Borough of Kensington and Chelsea. The park covers approximately 55 acres and comprises natural and formal areas together with a YHA hostel, childrens playground, cafeteria and public toilets. There are a number of entrances of which this is one and is known as Sun Trap. 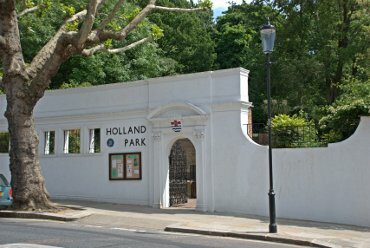 This is the entrance nearest to Holland Park Station on the underground Central Line. 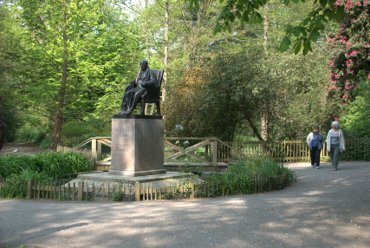 This is a very pleasant park and certainly worth a visit if you are near the area and it is walkable from Earls Court, Notting Hill, Bayswater and the museums at South Kensington. Soon after entering via the Sun Trap gate the paths go through areas of semi-wild woodland. 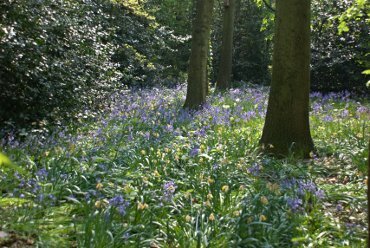 We were there in the middle of April and so the Bluebells were in flower. There are also a lot of Daffodils but they were at the end of their flowering season, when we were there, and were looking a little tatty. The path that we were on led us to the statue of Lord Holland, after whom the park is named, where we found a map board which gave us an idea of the layout of the park which was good as there were a number of paths running off in various directions. This path led away from the Lord Holland Statue towards the open air theatre. It was very decorative with numerous Japanese Maples along each side. 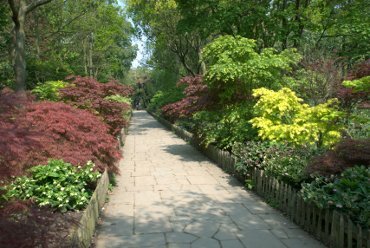 The path to the right of the one mentioned above led from the Lord Holland Statue, in a south-westerly direction, down to the Kyoto Japanese Garden. 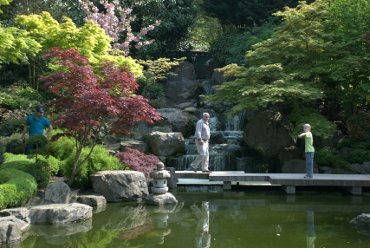 This traditional Japanese garden was created in 1991 as part of the Japan Festival of London and very nice it is too.